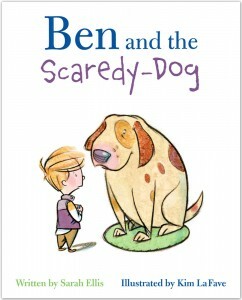 “Rating: E…Ben and the Scaredy-Dog offers a surprising perspective on overcoming one’s fears. As we see Ben be brave we also see another character overcome his own fears. Readers of all ages will enjoy this relatable and fresh story constructed in short, effective prose….La Fave’s colourful yet airy illustrations depict diverse characters and allow for the readers’ own experiences and imagination to fill in the setting. A fun read! “When new neighbours move in across the street, Ben is interested in meeting what could possibly be a new friend. But one thing is stopping him: his fear of dogs….Kim LaFave is an illustrator with a focus of paint, pencil and digital media. His images in Ben and the Scaredy-Dog are beautiful. The feelings of fear and uneasiness are clearly depicted on Ben’s face. The illustrations, by also showing body language, add another element to the story. Apprehension, fear and anxiety are normal feelings. A fear of dogs is common, but learning to cope with this fear is very important. Ben’s bravery is to be commended, and he provides a great example of overcoming a fear.